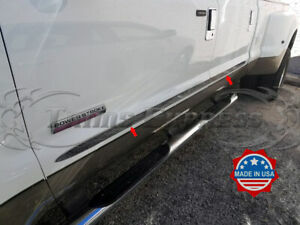 Details about 1999-2016 Ford F-250/F-350/Super Duty Crew Cab Flat Body Side Molding 4Pc 1.5"
1999-2016 Ford F-250/F-350/Super Duty Crew Cab Flat Body Side Molding 4Pc 1.5"
1999-2016 Ford F-250/F-350/Super Duty Full Size 4Dr Crew Cab. It is a stand-alone premium quality stainless steel pieces with polished surface and has the full pre-applied 3M tape on the back. Installation is easy, just peel and stick and it is done!